Andrea Libman is a Canadian voice actress and has a performing history for more than 20 years. In My Little Pony she voices the two main characters Pinkie Pie and Fluttershy for which she has received the Union of BC Performers Award for Best Voice twice! Additionally, she covers various other characters like Sweetie Drops and Fleetfoot. Alongside My little Pony, she has had roles in animated series like Madeline as Madeline, Maya in Maya the bee and Katya in Super Monster but also roles such as Bramble in Ducktales or Emmy in DragonTales. Recently she also was involved in Strawberry Shortcake’s Berry Bitty Adventures as the voice of Lemon Meringue, Princess Berrykin and more. Andrea teaches and plays the piano and enjoys running, skiing and snowboarding, as also yoga and volunteer work. She holds her Bachelor of Applied Science in Civil Engineering from the University of British Columbia. Vincent Tong is a 38-year-old Canadian actor and voice actor, with his first contact with My Little Pony being auditions for Prince Blueblood and Garble. Over time he started to voice well known characters such as Flash Sentry in the Equestria Girls movies and Sandbar with the beginning of season 8. With my little pony he had also his singing debut on the album “It’s a Pony Kind of Christmas”. Aside from My Little Pony Vincent Tong has been involved in different types of filmography such as film, anime and animation. Notable voice roles include Touta Matsuda in “Death Note”, Aki Light / Mega Man in “Mega Man Fully Charged” and roles in “Lego Ninjago” as Kai, Lizaru, Chokun & Ray. 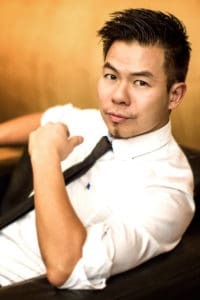 Vincent Tong graduated from Canadian College of Performing Arts and has a background in musical theatre with famous productions like Mamma Mia! And La Cage aux Folles in Vancouver.